John Barr started his fly tying journey in a garage many years ago when he was only five or six years old. He learned to tie flies from his next door neighbor, as many of us have, and that afternoon started a life long affair with tying flies and fishing them. Much of his early years fishing were spent in San Jose, California fly fishing for crappies and bluegills in the local gravel pits. As he branched out developing his skills he started fishing for trout in the Merced River, Yosemite National Park and streams and lakes throughout the Sierras. His favorite patterns at the time were a brown Bivisable, a hairwing Western Coachman, and a Western Bucktail. Today most of the flies John Barr fishes and ties are patterns representing aquatic insects since they provide a significant part of the diet for trout. His own designs include well known fly patterns such as the Copper John, Barr Emerger, Vis-A-Dun, Graphic Caddis and the Meat Whistle. These and many of his other patterns are contained in his book Barr Flies. You can obtain a limited edition, leather bound, signed and numbered version of Barr Flies at www.BarrFlies.com. The standard edition is also available here. John recently worked with Landon Mayer in the production of the DVD Landing the Trout of Your Life and is finishing work on a soon to be released DVD on fly fishing for bass titled Weapons of Bass Production. 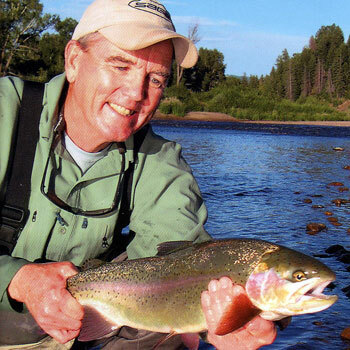 John Barr is a fly designer for Umpqua Feather Merchants, on the advisory staff for Sage, Simms, Rio and Outcast, and is a member of the Ross pro staff.